In this episode we’re delving deep into the idea of monetisation for the first time, and that’s in the form of affiliate marketing. During the episode I talk a little about starting out in affiliate marketing and how it can be used well to monetise a podcast. I’ll also explore a few of the best plugins to start out with which make it nice and easy to create links and make sure they’re relevant to your visitors, no matter where they’re based. Let’s get started! Amazon is one of the best and easiest options to start getting involved in Affiliate marketing. It has a huge range of products, so no matter what you’re working with or what your niche is, you’ll generally find something that will suit your market. Amazon also gives pretty decent commissions for such a big retailer – 5% is the minimum. This plugin turns any normal Amazon link into an affiliate link for the correct country. It is a free plugin that works efficiently and perfectly in affiliate marketing. I’m afraid this plugin is a little hard to find, but if you can track it down it could be worth a look. EasyAzon 3 is a powerful WordPress plugin that can help you make more commissions and save a whole lot of time in the process. One of the big benefits is that it create your links automatically, as well as adding the “nofollow” attribute. Another big benefit of this plugin is that it pop-up a tool tip over every link which shows a little summary of the product within your website. The Amazon Link Engine plugin is a way to convert all Amazon links within your WordPress site into affiliated links that work across all Amazon storefronts. Please bear in mind that this is a plugin I’ve not used, though, so I can’t vouch for it’s ease of use or quality. Skimlinks takes away all the effort usually associated with affiliate marketing, working behind-the-scenes and earning you commissions from the valuable links you include in your posts. It turns any link that you put out to a different product into an affiliate link. Choose a couple of the products you want to promote, a product that is genuinely valuable to your audience, and then put an affiliate link to it on one of your latest posts, or in your sidebar. Get either EasyAzon, Skimlinks or find one of the free affiliate marketing plugins and get it working. Post a comment below and tell me what plugin you went for. What do you think of the Affiliate Link tools mentioned on this show? Which plugin do you find most convenient? What did you promote? Tell me the results, I’d love to know! Finally, if you’re enjoying the series, I’d really appreciate it if you’d give me a review on iTunes. It really helps to get the show out to more people and grow the PodCraft community. Just pop over to PodCraft on the iTunes website to do that. Thanks for listening and I’ll see you on the next episode. Hey folks and welcome to another episode of Series 3 of PodCraft, this is the series where we’re looking at how to create a great home for your podcast on the web using the wonderful tool of WordPress as I’m taking you through 20 steps tools and tips of how to create it and make it work for you to grow your listeners, really make your podcast successful. Yesterday and a couple of days before that we were talking a little bit about mailing lists. We’re talking about how to build a mailing list and how to make it really work, how to get the conversion rate up and get as many people as possible signing up for your mailing lists. Today, I promised we’re moving on to affiliate links, so this is about more on monetisation. This week, obviously, this third week of the four week series is on monetisation and growth and this is the first one we’re really talking about proper full-on monetisation using affiliate links. And really, it’s an introduction to affiliate marketing because I’m going to talk about one of the easiest affiliate programs to get involved with, a couple of them actually and how to make them work for you, how to really implement them in a really easy fashion. So, what are they? For a lot of people, you won’t be surprised to hear this probably, Amazon is one of the best and easiest options to get involved in affiliate marketing. The main reasons are that they have such a huge range of products, so no matter what you’re working with, what your niche is, whatever you’re talking about, you can generally find something that will suit your market. Find something on there whether it’s a book talking about your subject, whether it’s a product that people could buy that they might be interested it, even something that might be just vaguely related, you know, that people buy everyday that you can put on there. And also, actually, Amazon do pretty decent commissions for such a big retailer. A lot of retailers have quite low affiliate rates down to 3% mark whereas Amazon generally has 5% as the minimum and actually once you start to sell a lot more products, it can go up to 7%, 8%, 9%, 10% depending on volume. So, it’s a great program, really good program to get involved with and it’s a good on to start out and just cut your teeth in affiliate marketing. And it’s also a really easy one to implement on a WordPress website because it’s such a common, such a big affiliate program, there’s quite a few tools built around it. The main problem with Amazon affiliate marketing is internationalisation though, so talk about the basic way to do it, when you sign up for an Amazon affiliate account, you basically get an account with them that lets you go in and lets you create affiliate links quite easily. So, you go in to the back-end, you log into the account and you can choose a product and you can say, “This product I want an affiliate link for” and it’ll spit out that link. So, you take that link, you place that into your post and that’s it essentially. But the problem is that, that points to wherever your local store is, so if you’re on, well, I’m in the UK for example, so I’m linking to amazon.co.uk as standard because that’s where the majority of my listeners are. But that means that anyone that’s outside of the UK would still be directed to. co.uk stores which they can’t buy from, so obviously if they do that they’ll see the product they’ll go “I actually like that but I’m going to buy it in my .com store” so US listener, for me, would go to .com they would buy it and I wouldn’t get any credit because I’m not a member of the .com or I’ve not directed the user to the .com website. So, that’s the big problem with Amazon in terms of internationalisation. So, that’s one of the biggest problems I went to solve on the first start, to look for tools to make Amazon affiliate marketing easier. The second one was that, actually while Amazon do offer those tools to create affiliate links, it does take a little while to get into the back-end, to create the affiliate links, to bring them back out, to put them into your website. The easiest way is actually just to find the product on Amazon in the front and just copy over the link. And really what you wanted to do is then to convert that to an affiliate link for whatever geo-location that person is in. So, if they’re in the US, it’ll turn it into a US affiliate link, if they’re in Germany, it’ll turn it into German affiliate link, etc. And actually, ideally, what you wanted to do is add the nofollow attribute as well because as we all know Google frowns on passing links when it’s paid for. So, an affiliate link counts as that, so if you’re linking to a product but you’re getting paid for it, even if it’s thru affiliate marketing, you need to be putting nofollow on to that link so that you’re not passing any authority thru that link. And if you don’t do that, you can get Google slap so you can lose a lot of authority in Google, maybe lose your search rankings, so, that’s something to be really careful of. So, in the early days, as I was saying, I was making these links manually. They were only going to the UK Amazon store, I was adding the nofollow manually, it was all a quite involved process. Took quite a long time and sometimes I would miss a nofollow, I forget about that. Sometimes I’d put on an Amazon link without remembering to make it an affiliate link so essentially I wasn’t making the best value I could of this. And that’s when I start looking into tools to make this a bit easier. Now, I looked into, for this episode obviously, I looked into the old tools that I used in the early days and it’s a bit annoying because there was a great plugin called Amazon Affiliate Link Localizer, it was simple as anything. All it did was plug it in, so you install then plug it in and all you did was get your Amazon affiliate link for each of the international affiliate programs. So, I would have one for the UK program, one for the American program, one for the Canadian program, one for the German program and I’d put it in the relevant box and the plugin would essentially turn any normal Amazon link into an affiliate link for the correct country. And it worked perfectly, it worked so simply, it was just excellent and it was entirely free, that was the best thing about it, so, it costs you absolutely nothing to do. I looked up that to find the link to it today for this episode and apparently it’s gone. So, I hear people saying that it’s still works, so if you can track it down, by all means do get a hold of it and use it because there are people saying out there that it does still work and it’s still entirely free. So, if you can track it down, it was called Amazon Affiliate Link Localizer, by all means. I couldn’t vouch for the fact that it’s still up-to-date so it maybe that’s the problem. But it is a bit annoying because that was great, that was the way I got into in the first place and that earned me many, a commission in the previous years. Now, the reason I’m not using it now is because I moved over to EasyAzon. So this is another plugin called EasyAzon. The problem is, it’s a paid plugin, so you have to buy it. So it’s $50 for the basic, I think, and about $70 for the paid one. The benefits of it are that, it’s a little bit smoother, it’s a little bit more developed because it’s paid plugin obviously they’re putting a bit more work into it. You can find it if you want to go and have a look at it just now podcraft.net/easyazon, so you can find it at that link, that’s an affiliate link, so I do get a small commission if buy it thru that. 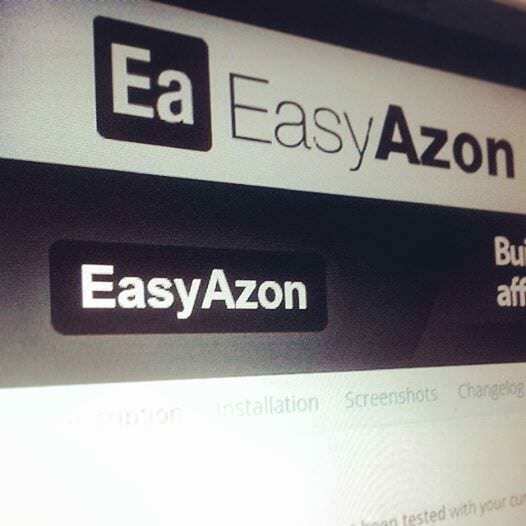 If you enjoy the content obviously I’d appreciate if you use it, if you don’t then by all means just by-pass that and find it yourself, just search EasyAzon on the web. But yes, if you pop-over, have a look at it. The benefits of it, as I said, one of the big benefits which I really like is that fact that it creates your links for you automatically, it puts on the nofollow automatically which is something that the previous one, Amazon Affiliate Link Localizer, did not do. And as I just said, I used to forget the nofollow every now and then which really risks my search results. So, EasyAzon added both of those automatically which is really handy. But the big thing as well was it popped up a little kind of tool tip over every link, so if I was to link to a podcasting microphone or a podcasting mixer on my podcasting website, it would not only create that as an affiliate link, it would allow people when they hover over it, it would pop-up a little picture of the product and a little button that said “Buy on Amazon Now”. And it was a really nice little way of letting people see what that product look like, get an idea of the price actually, that was one of the big things that show the price in that little tool tip as well. So, it was just a really nice way of showing that product without letting people, without forcing people to click away from your website to Amazon to check it out. So, it gives them that little summary of the product really quickly and easily within your website. And that was really the sole reason that I thought it was worth paying for EasyAzon, it just made it so much better. And also, I mean, if you’re making even $10, $20 a month off this program then you pay it back over just 2 or 3 months so actually I thought it was a pretty bargainous price for a plugin that can make you quite a lot of money. So anyway, if you wanted to go and check it out, if you wanted to buy EasyAzon, which I would recommend, really good tool, really handy, really easy to use, then go to podcraft.net/easyazon, so, that’s E A S Y A zed O N.
I did have a look for some free alternatives. No, I’ve not use this, so I can’t recommend it entirely but it may be worth a look, one called Amazon Link Engine. It looks like it’s got some good reviews on the WordPress plugin site and it looks like it does exactly what I would want it to do. Again, I haven’t looked at it so please don’t e-mail me, “I tried it out” e-mail me after and say “It’s absolutely crap” because I don’t know but might be worth the look if you really don’t want to pay for EasyAzon. I’m still just annoyed that Amazon Affiliate Link Localizer is gone, it was such a good tool, I don’t know the guys stopped developing it. Because I’m sure he made a lot of money of it because anytime you didn’t put it, say, an affiliate link for the Japan’s store, the Canadian store, whatever, he would get that, so it would actually turn into an affiliate link for himself if you didn’t use that program which I thought was entirely fair enough. Now, the last thing I want to mention, just before we tie up this episode is that there is one other option and that’s called Skimlinks. So, Skimlinks is a tool, is a program that essentially turns, well, it’s an organisation that are affiliated with a whole bunch of affiliate programs. So, they don’t only work with Amazon, they work with lots of other companies. So, they work with tons of companies that actually don’t have open affiliate programs. And Skimlinks works in a very similar way and that it looks through your post and it turns any link that you put out to a different product into an affiliate link. So, say, on my mountain biking website that I run, I was to link out to a pair of Merrell trainers, so Merrell trainers that are good for cycling, I link off to their page on Merrell, Merrell don’t really run an affiliate program so I don’t bother trying to do that, I don’t bother trying to make money out of it, it’s just to show people a good pair of trainers but Skimlinks because it’s such a big organisation, they do have an affiliate agreement with Merrell and they’ll turn that into an affiliate link and give me an affiliate commission for that. The reason I don’t mention this as a main option is because Skimlinks do take quite a big percentage, so they do take a good chunk of the commissions. For example, they do link up with Amazon, they do all the stuff that EasyAzon does, like geo-location, the automatic linking, all that kind of stuff but they do take a chunk of your Amazon commissions. And because I work solely or mainly with Amazon, I prefer to use a plugin that gives me all of the commissions and I pay for that plugin, for the privilege I give them just a one-off payment and I take all of the commissions so that’s why I don’t tend to use Skimlinks with Amazon but if you want to take a lot of the hassle out or if actually the products that you sell or the products that you link to, the type of things that you talk about don’t tend to be on Amazon or don’t to have their own affiliate agreements, worth looking up Skimlinks to see if they have an agreement with the companies that you might be talking about. Again, check how much you’re giving away to Skimlinks but again I don’t think there’s any reason to grudge giving away like a third of your commissions if in the end gets you more commissions, I mean, two thirds of a hundred commissions is better than a hundred percent of none or one or whatever. So, it’s better to get more commissions and get less of, less percentage of them than none at all. So, Skimlinks is worth a look. If you want to go straight there, just go to podcraft.net/skimlinks and that’ll take you to the Skimlinks website. So, I hope that was a good little introduction to affiliate marketing and how you can integrate it into your podcasting website in a really easy way. The plugins I’ve talked about save me absolutely tons of time over the years in terms of promoting Amazon products and I’ve made a good chunk of all side income for the websites that I run as well. So I can really vouch for the fact that they’re worth putting the time into and worth investing in. So, the task for today will be to choose one. So, it will be to choose just a couple products that you want to promote, couple of things that you think will be genuinely valuable to your audience. That’s the important thing, don’t be pulling any old rubbish here, you want to make sure that the stuff that you promote actually is useful to the people you’re talking to, is useful to your listeners. There’s nothing sustainable about marketing rubbish to your listeners because people will be straight away know that you’ve given them a bad recommendation and they won’t come back. So, really, all you want to be doing is recommending stuff that either you like, you use so you can genuinely recommend it or that you know from reputation or you know from other people talking about it, reviews, that type of thing that is good stuff and make sure there is something that’s really going to be interesting to the people that you talk to, to your audience. So, find something like that, find something relevant to your audience and stick it on one of your latest post or stick it in the sidebar, you can put adverts on your sidebar to products and use them as affiliate links as well. See if you can get your first pound, your first dollar out of your website in that way. Get either EasyAzon or get Skimlinks or find one of the free plugins to do that and just get that working automatically, that’s your tasks. And then pop on to the show notes which are at podcraft.net/314 and pop a comment in there and tell me what you’ve gone ahead and promote it. So, I’d love to hear what it is that you talk about, what your subject is and what it is you’ve chosen to promote as a result. So, what do you promote? Stick that in the comments and let me know what you think. Okay! Thanks again! Tomorrow we’re on to the last episode of the week. So, that’s week 3 nearly finish of the Series 3 and that’s us on to about social sharing. This is one of the best ways to grow your podcast, to really get the word out about your content. So, I’m going to talk about one of my best plugins for really allowing people to share your content on social networks like Twitter, Facebook, etc. And a couple of other benefits that come with it as well. So, I hope you join me again then. So, thanks again for listening and I’ll talk to you then.